Welcome to another edition of Progressive Eats, our virtual version of a progressive dinner party where each course is held at a different home. With Progressive Eats, a theme is chosen each month and you can hop from blog to blog to check out the different recipes we’ve made. This month’s theme is Apples, the perfect symbol of Autumn, hosted by Liz of That Skinny Chick Can Bake. You’ll love all the recipes that will be perfect all fall and winter long! Make sure you check out the links below the recipe. When I was young, I loved the applesauce my mom would give me on days when I had an upset tummy. It was sweet and soothing, just the thing for a little one under the weather. I didn’t know at the time, but she would go to the store and buy fresh apples so she could make her own from scratch. No wonder it tasted so good! A blend of apples makes the best applesauce! I had made applesauce occasionally over the years, carefully peeling and coring the apples, but usually I fell back on store-bought varieties. They are convenient and I often had trouble eating a full batch of my own. I always used yellow or green apples, not really paying much attention to the variety. Then I started studying how different apples are used in combinations to make the perfect apple pie. Would it be the same for applesauce? I took a cooking class and the teacher suggested that instead of peeling and coring the apples, we use a food mill and make our life a lot easier. Boy was she right! No more muss or fuss, just quarter the apples and toss them in a big pot to cook down. When they are softened, scoop them into a food mill set over a big bowl, and press them through a screen. The screen captures the solids, and allowing the beautiful apple liquids through. So simple! A food mill makes quick work of pureeing foods! If you haven’t used a food mill, you should consider it. If you make your own baby food, mashed potatoes, other pureed foods, and of course applesauce, it will make your life a whole lot easier. Depending on the size of the grate screen you use, you can control the texture from silky smooth to slightly chunky. Don’t worry if the fruit is taller than your pot, it cooks down! I browsed some recipes to see what techniques other people use for pink applesauce, and many include red cinnamon candies to boost the pink color. I laughed because you don’t need that. It would definitely give you a deeper pink, but many kids have issues with food dyes. All you have to do is include some dark red apples with their peels and you have pink applesauce without using food coloring! And if you want to deepen the color more, add a plum or two. Naturally beautiful. See how much the apples have cooked down! Almost ready for the food mill (in the back) – and look at that beautiful rosy liquid. With a large Dutch oven and a food mill, you can turn a whole bushel of fresh apples into a fabulous treat for your family and gifts for friends. You can pour it into sterilized mason jars (leave an inch of headspace), seal them and put them in the freezer. Then you can deliver a jar of frozen homemade applesauce to friends all year long! Run, don’t walk, to get a food mill. It will save you oodles of time and work. If possible, go up one level and you will love the food mill even more! Set out your largest pot - I use my Le Creuset Dutch oven. Set your food mill on a large heat resistant mixing bowl, such as Pyrex, with the middle size grater disk in place. Set a second medium heatproof bowl on the counter with a rubber spatula next to it. Prepare the Apples: Rinse all the apples well and set on a cutting board. If you are adding a plum or two, rinse them as well. Using a sharp knife, quarter the apples and place in the pot. There is no need to chop, peel or core them if you have a food mill. If using, halve the plums and discard the pits. Add them to the pot. Sprinkle the fruit with the sugar and salt. If you want to use a cinnamon stick for flavoring, tuck it into the pot. Add enough water or juice to come about 1/2 inch up the pan. The apples will give off a lot of water so you only need enough to get the cooking started. Don't worry if the fruit mounds above the edge of the pan. As the apples cook they will collapse and the pile will get shorter. Cook the Apples: Place the pan over medium-high heat and cover the pot. When the liquid has come to a boil, remove the cover and reduce the heat to medium. You want the liquid at a low boil. Let the apples cook, stirring occasionally, until completely softened, about an hour. The timing will depend on the size of the apples and the size of your pot. Press on the apples occasionally with a spoon to judge their softness, moving firmer pieces under the liquid in the bottom of the pot. Make the Applesauce: When the apples are fall-apart-soft, scoop a couple of ladles of them into the food mill set over the bowl. Use the handle to turn the food mill blade, pressing the softened apples under the blade. Occasionally turn the blade the opposite direction to release anything that is caught and to get the rest of the apples under the blade. If you used a cinnamon stick, pull it out and discard it. Occasionally use the rubber spatula to scrape the bottom of the food mill, getting all the pureed applesauce into the bowl. Then scrape out and discard the solids left in the food mill - the skins, cores, seeds, etc. I do this at least 3 times when I am making a large pot of applesauce. As the bowl under the food mill gets full, ladle some of the applesauce into the second bowl. You need some room under the food mill for the new pureed apples to be added. Continue scooping, turning the food mill, reversing directions occasionally, and discarding the solids, until all the apples have been pressed. Adjust the Flavors: Combine all the applesauce into one bowl and taste it. If it needs additional sweetness, you can stir in some honey or agave syrup but not sugar because it will not dissolve fully. If you decide you want to add ground cinnamon or nutmeg to the sauce, stir it in. Taste again and adjust flavorings and sweeteners as needed. If you get it too sweet, squeeze in a little fresh lemon juice. To Store your Applesauce: When it is fully cooled, you can hold it in the refrigerator, covered, for up to a week. For longer storage, transfer to sealable containers, leaving 1-inch of headspace, and storing in the freezer from 8 to 12 months. If you will be freezing the applesauce, do not add any spices. Spices lose their flavors during freezing, so plan to thaw the applesauce you want to eat and then stir in the spices before serving. For more information on preserving foods and finding the best recipes, visit Punk Domestics or for safety tips, see The University of Minnesota Extension website. Let’s connect! If you ever need any entertaining or cooking advice, need to alter a recipe for gluten-free, or want recipe suggestions, don’t hesitate to email me. I can also be found at the social media site links on this page. This post may contain Amazon affiliate links. If you purchase a product via my links, it doesn’t cost you anything and I earn a tiny commission, which helps offset the costs of producing The Heritage Cook blog. Thank you for supporting me. Welcome to The Heritage Cook Family! I make applesauce every fall using some of our local Georgia apples. It’s so totally different and more delicious than the purchased varieties! And I agree that a mixture of different types of apples makes for a much more flavorful sauce. Thanks for the tip about including a few plums for color – that’s brilliant! It makes it just a little more fun Lana, but certainly isn’t required. I’ll bet your homemade sauce is outstanding! My homemade applesauce is the single most requested recipe on my Thanksgiving table – the peasants would revolt if I didn’t make it! 😉 ha ha ha. I love that you used a couple of plums to pump up that beautiful color. My mom once made a pink applesauce (about 17 years ago) that was so good…didn’t use cinnamon candies or anything other than apples…and then promptly lost the recipe. We’ve never been able to recreate that particular version, but continue to think about it. I’m going to try this one as an addition to my normal one this year – surprise the masses! I hope this comes close to your memories – you can leave out the plums, but as long as you have red apples with their skins on in the mix of apples, it will be a lovely light pink. Enjoy! Fall has always been about apples for me. Growing up it was the one fruit that ruled our lives, like grapes would in rural France or Italy. But our culture didn’t have apple sauce. I love the fabulous color of your apple sauce. Just so royal. I love making homemade applesauce, though I’ve never tried including the peels for color. Great idea! I always learn something when I take a cooking class – this was one of the best tricks! It also makes this so easy and quick to make with the help of the food mill. Hope you give it a try! The addition of the plums is genius, Jane! I can just taste this applesauce!! I’ve often used store bought varieties too, but I agree they’re not nearly as good as applesauce made from fresh apples. Thanks Susan, the plums are a great addition – and we could certainly use any fruits we love to add to the applesauce, they just won’t all give us the pretty pink color. 🙂 We should definitely plan a trip to Apple Hill either this season or next. How fun would that be!! I would love that! I’ve never been there and love field trips!!! I love the idea of adding plums! Thanks Theresa – isn’t it a fun idea! You can’t taste them but they do add a nice punch of color! I know, I really laughed when I saw so many recipes using that ingredient. I get how it could flavor the applesauce and add color, but I’d rather use a cinnamon stick and natural ways to get the color. I was almost tempted to continue cooking my sauce down into an apple butter, but I knew you were making one and it would be better than anything I could make, LOL! This reminds me so much of the apple sauce I used to eat at my grandma’s. I think my mom got the food mill, but I haven’t seen it in years. Though I probably have no hope of finding that one, you make me think I should get one of my own to make this lovely type of applesauce – an old school favorite! I’ll bet that a new one will be a lot easier to use than the one you might find at your mom’s house. They are not that expensive, especially when you think of multiple ways to use it, like ricing potatoes before mashing them! 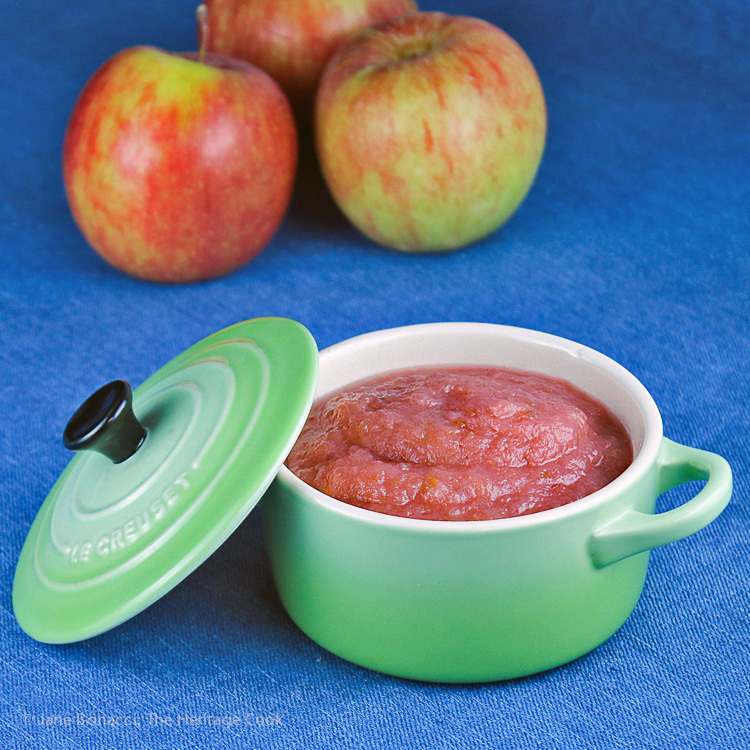 I love the natural pink hue to this applesauce – I’d never think to leave the skins on. I always learn little tricks when I go to cooking classes with great chefs and this was one of them! I love the delicate pink with only the red skins, but I wanted this to be darker for the photographs, so added plums. Thank you Liz. It’s funny how we know a technique and only think to use it in one type of recipe. Multiple apples are great and add a lot of depth of appley goodness, LOL.